Finally, we come to the fourth and final category of ICF core coaching competencies, namely, Facilitating Learning and Results. The first competency under this is Creating Awareness. Now, this is quite a long list. 8. Creating Awareness – Ability to integrate and accurately evaluate multiple sources of information and to make interpretations that help the client to gain awareness and thereby achieve agreed-upon results. Creating awareness in a client depends on the coach’s level of skill in the other competencies such as in active listening, powerful questioning, and direct communication. Creating a shift in awareness can involve a series of steps, or even sessions, asking various questions and giving insightful feedback until the client has an “aha” moment, until that one question or observation that hits the nail right on the head. Why is it often times challenging and difficult to create awareness? Remember the Johari Window? A client may have all sorts of unexamined assumptions about herself and others, and what’s going on in relation to what the client asked to be coached on. Figure retrieved from Johari Window. 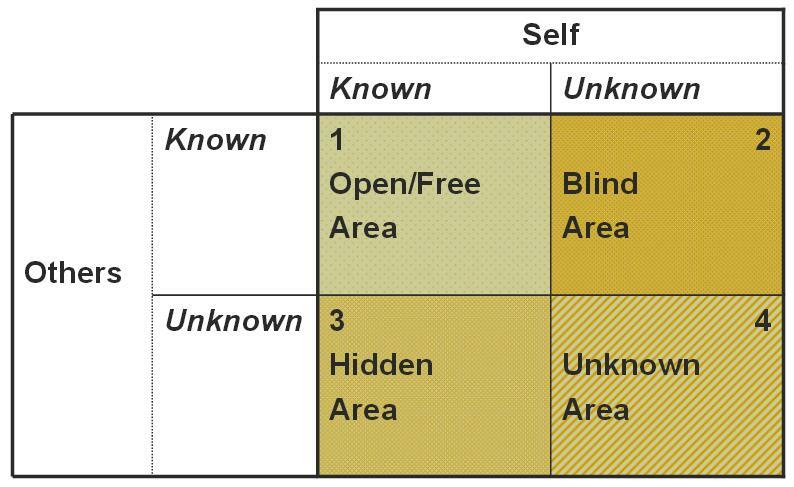 Even if the Johari Window may not be explicitly used during the coaching session, the coaching process helps the client explore the four perspectives represented in the table below, namely, the areas that are “unknown” or “hidden” from the client vs. areas that are “known” to herself and to others. Creating awareness is not an end in itself but rather a means to “raise” the client’s starting point for constructive actions in moving forward in achieving her goals. One executive who lamented that her team was not able to carry out and complete the projects they agreed to do during the year, later realized that it was her way of managing, or actually not sufficiently managing, her team so that they had a very clear idea of their project charter, their deliverables, their timetable, their resources. The team had gotten into the habit of letting the project schedule slip and were complacent in not producing their deliverables. There were no drastic consequences for failure to deliver. She wanted her team to be successful but was not sure what else she should do. One question that helped to create a shift in awareness was, “What are you doing, or not doing, that’s keeping them in the state“? The point of the question was that before we can expect others to change, we must look to ourselves and ask what we must change in ourselves so that the others can change as well. It was a question that was meant to explore the client’s Blind Area. The executive assumed that if she gave them the freedom and flexibility to direct their work and just checked on them a few months down the road, that the team would do better. However, more discussion revealed that the team probably didn’t really know what they they were expected to produce and by when. They didn’t have all the required information, knowledge and skills necessary to successfully complete the project and didn’t ask for help either. The team didn’t have sufficient initiative and commitment. They had little sense of urgency. Upon realizing that how she managed her team had an impact on their poor performance, she identified what she would do differently so as to help the team better understand the requirements of their internal clients and deliver on these. The awareness enabled her to consider different ways of managing her team, experiment with these, observe more closely what worked and what didn’t, reflect on her experience and work with her team more effectively. Posted on June 9, 2014 by Ma. Carmen L. Testa. This entry was posted in Coaching Core Competencies and tagged Coaching Competencies, Executive Coaching, ICF Core Competencies, Leadership Coaching, Life Coaching. Bookmark the permalink.